No images of Solar Recycle PTY LTD Installations. Excellent service from quote to installation to smart meter. True to their word, the system was fitted within their 2 week time frame. After sales was excellent, had nothing to worry about at all. The estimator thought it would be a 5KW system, but the installers could not fit that many panels on the roof. The installers were the only ones who were not put off by a two storey building and novel building materials. Others just walked away from the job. I had been considering solar for 2 years and did not really understand it even though i spoke with many companies. Price was expensive and i was not really convinced that it would payoff. 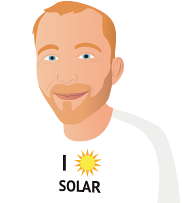 I was contacted by Solar Recycle and i drove richie mad for almost 3 weeks with questions that i learned and eventually went with them. I always say that a company is only as good as it's products and after sales service as i purchased an inverter that i was familiar with even though he recommended another brand and after two weeks it failed i called richie and he straight away sent someone out and in the end i asked them to replace it with the recommended inverter and they did no fuss.